Figure I.2.1 shows the onshore wind energy resource, as computed on a broad scale for the European Wind Atlas. The map shows different wind speed regions. The wind speeds at a 50 m height above ground level within the regions identified may be estimated for different topographic conditions using the table below the figure. The wind speed above which commercial exploitation can take place varies according to the specific market conditions. While countries such as Scotland clearly have exceptional potential, with rising fuel prices and consequently increasing power prices, every European country has a substantial technically and economically exploitable wind resource. 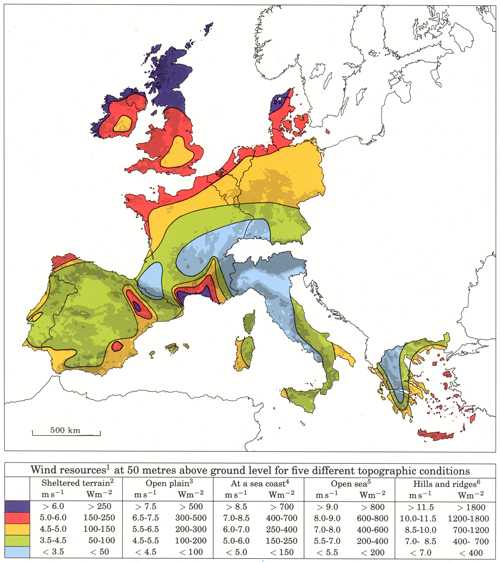 The European Wind Atlas employs meteorological data from a selection of monitoring stations, and shows the distribution of wind speeds on a broad scale. It has been used extensively by developers and governments in estimating the size of the resource and regional variations. It is possible to map wind speeds at a higher resolution, using, for instance, more detailed topographical data and a larger sample size of meteorological data, in order to show more local variations in wind speed. This can be used by developers looking for sites in a particular country. A review of national wind atlases for European countries has been undertaken for this edition of “Wind Energy – The Facts,” the results of which are shown in Table I.2.1. Where obtained and permission granted, map reproductions are contained in Appendix A. The European Wind Atlas resulted in the development of a wind-mapping tool called WAsP, and this is used widely for both broad-scale wind mapping and more site-specific applications. Table I.2.1 distinguishes between the use of WAsP and 'other' wind mapping methods. Wind atlases for offshore are covered in Chapter 5: Offshore.